You only get one chance to make your very first tandem skydive. 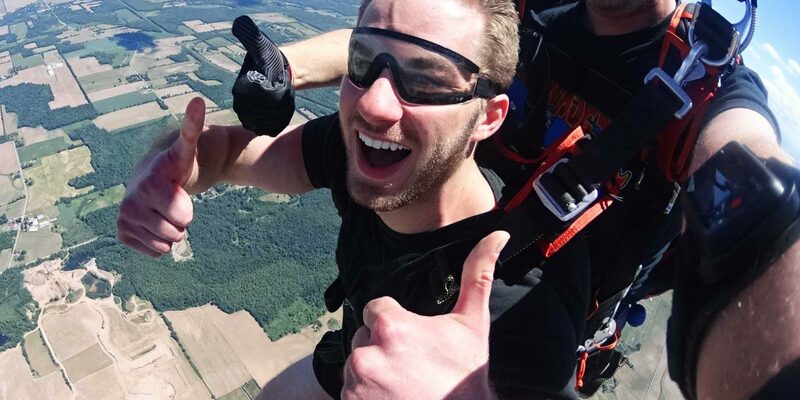 At WNY Skydiving, we understand how important it is to capture the thrill and excitement of that experience on video to share with friends and family. 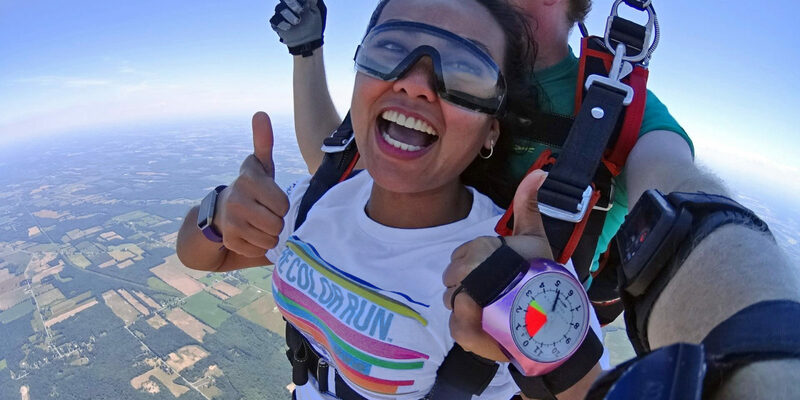 As skydivers, we all remember that first jump and cherish the skydiving videos and photos that document that important initial step in our journey. Whether you make one jump or a thousand – we consider videos or photos a MUST! HOW WILL I RECEIVE MY SKYDIVING VIDEO? All skydiving videos and photos are delivered via email. 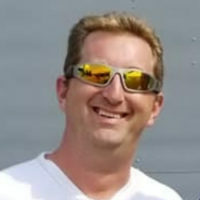 WNY Skydiving uses Dropbox.com for all of our media. We have found this to be the most convenient option for our students. Email delivery allows you to share a link to your photos or video with friends and family immediately. You will be able to download your videos pictures and share on your preferred social media platform. You can also quickly and easily upload your skydiving video to YouTube, Vimeo, or any other video hosting platforms. Re-live your incredible experience again and again when you share your skydiving video with friends and family! From the excitement of take-off through the post-jump interview, your video will capture all the best moments. You’re the star of your very own adventure show. Our video package is the perfect way to show off your bucket list. Don’t like being recorded on camera? We’ve got the perfect solution for you! 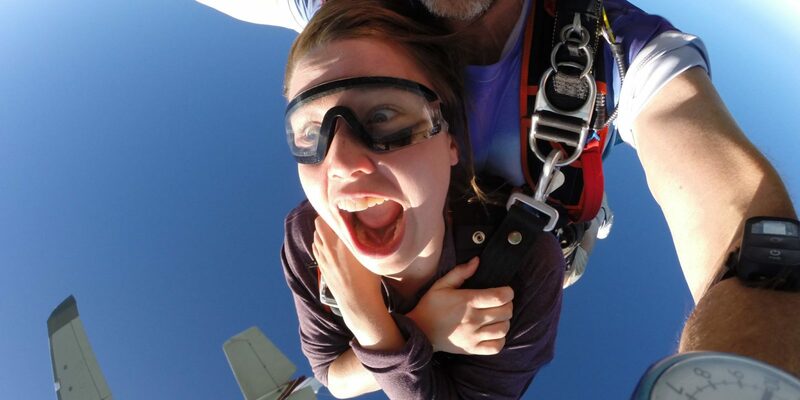 With our skydiving photo package, you’ll receive photos of all the highlights. This package is ideal for people looking to quickly share a taste of the experience with friends, family or on social media. Each student will receive over 100 photos, capturing all the best moments of their skydiving experience. This is our premium media package and something we highly recommend! You’ll receive both video and photos of your jump. The skydiving Video and Photo package is truly the best of both worlds. WHY DO I WANT A SKYDIVING VIDEO? As the owner of WNYSkydiving, I made my first jump many years ago at a dropzone in Mexico. I was in college, so money was not exactly free-flowing. I was making my tandem skydive as a “once in a lifetime event.” Little did I know I would someday have nearly 7,000 jumps! The owner of the dropzone I made that first jump at was selling me hard on a video and photo package. I told him I didn’t want the video. He kept pushing it. I told him I couldn’t afford it. He kept pushing it. Finally, just to shut him up, I bought the pictures at half price, which was still way more than I wanted to spend. Now, many years later I cannot believe how lucky I was that I got these photos. There is no way to describe my first skydive (a comment I now get from all of my students). These pictures are proudly displayed on a wall in my home. Not only do I get to tell a great story whenever someone asks about them, I get to re-live that first jump whenever I see them. Getting a video of your first skydive isn’t for everyone, but it should be. After all, this is the only time you will ever make your first skydive! Have questions about our skydiving video and photo packages? Our staff will gladly assist you!